Betsy DeVos is gearing up for another tour, this time in the South. Chalkbeat shared the questions she is asking about schools. Here I try to interpret her questions with answers to what she is really getting at. I believe her questions are related to technology and “disruption” in education. The drive is to transform public schools to online learning, without teachers and brick and mortar schools. Students will learn anytime and anyplace without teachers and school structure. Here are her questions and interpretation. Is she asking to limit educators? This is unclear. She could be wanting to limit educators and replace them with tech. I think she is implying that teachers will be liberated with technology. This might sound fetching to teachers who have been bound for years by corporate reforms that tell them how and what to teach. Those reforms have led us to this moment. DeVos and her ilk are not pro-teacher. She is often critical of teachers and public schools. What’s holding the tech transformation back? Teachers, and parents who still value human interaction. Many parents are weary of so much tech taking over their kids’ lives. They have nightmares about the loss of their child’s privacy when it comes to tech and schools. Technology extends the benefit of a great teacher. To meet each student where they are by providing engaging instruction, the just-in-time supports, and key real-world learning opportunities, technology must play a role. This can manifest in a flipped classroom allowing for technology to be a dissemination of direct instruction from that great classroom teacher allowing for practice and application to happen in the classroom under the expert tutelage of the teacher. Teachers bragging about how they flipped their class, don’t realize they’ve handed over their expertise to the computer. They’re simply furthering that online information along. The fear is worthy of a science fiction novel, but it will be the new reality. A teacher arrives at work one day, but their key won’t fit the classroom door. When they peek through the window they see students online, working on their own. It will be all tech and no teacher. Why assign kids to schools based on their addresses? The next question Betsy DeVos asks involves destroying the public school as hub of the community. For example, think about how towns rally around their high school football and basketball teams. If connections like these are dissolved, or privatized, public schools will be no more. Today, we learn everywhere: in formal classrooms and informal basement workshops; in less-structured environments, such as makerspaces and libraries; and in more-structured contexts, such as religious institutions and dojos. We know that future success rests not only on our students’ content knowledge, but also on their behaviors and mindsets. Our graduates need to draw from the skills they develop in multiple arenas, yet the skills they learn in one space are rarely acknowledged or valued in others. This question goes beyond picking out schools that she believes children should have the freedom to attend. Betsy DeVos is talking about breaking up the structure of a school. Child development progresses similarly in most children. So, placing children in grades makes some sense. Children also socially get along best with peers their own age. Some children progress faster, or work slower, than their classmates. Others may have learning disabilities. Teachers differentiate their instruction according to student needs. DeVos is likely referring to placing students on digital devices to work on material at whatever level the student may be. Students will work by themselves. This is a maddening question from DeVos. Here’s why. For years, corporate reformers, like DeVos, have wielded much authority over public schools, simply due to their wealth. They blamed teachers for society’s problems, problems corporations themselves often created. 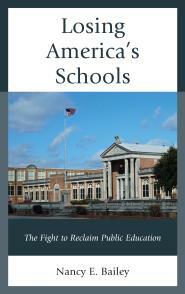 They accused public schools, our most democratic institutions, as failed. They’ve demanded unfair accountability through one-size-fits-all high-stakes tests. They cared nothing about the student’s individual needs! Many public schools closed, and good teachers were damned by unfair evaluations. This has had tragic results for students, families, and communities. Drive through most cities and you will find abandoned school buildings. Now, these same corporate reformers promote online personalized learning. It is true hypocrisy. Why measure education by hours and days? When there are no more public schools, a child can be online any time a parent, or the child, want. Without structure, it’s difficult to see how students will automatically focus and learn on their own. Parents will have to homeschool with the use of technology, whether they want to homeschool, or not. Charter schools set up with technology and facilitators who will keep kids in line will be the new schools. Teach for America types seem perfectly made for these roles. The amount of debt a student will now find themselves owing makes four-year colleges out of reach for many students. Vocational education is looking more attractive. There is much to be said for career-technical education. But there’s growing alarm among parents over how early career education is being foisted on students. In some places juniors and seniors in high school are already working on career preparation. The fear is that students who could go to a four-year college, if they had the money, will get streamlined into vocational careers. Corporations could use schools and manipulate students to meet their needs. They are not thinking about the hopes and desires of the students. Why believe learning stops at graduation? The new reality is that students will continue needing to reinvent themselves by obtaining badges and microcredentials in order to find jobs where they will fulfill the needs of the economy. Much of DeVos’s tour will be to vocational programs. She always highlights these schools. Her questions reflect a world where children will learn through digital devices, and what they learn will lead them to corporate goals that dictate how their world will run. 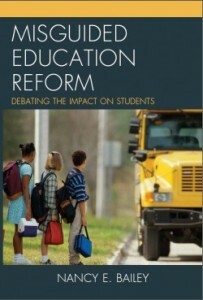 This is the goal of the education reformers. Nancy, KnowledgeWorks is a notorious “cradle to career” supporter. Their partnering with Institute for the Future is downright scary. Not just for education, but entire restructuring citites. Yes. I agree. Thanks, Lynne. I think you have written about it? I’ve tried to locate her tour schedule. Nothing to be found. Four states in three days and very little to nothing on the US Dept of Ed site except the questions that you write about-of course spot on commentary. If you find anything would you please post it to FB? Mil gracias. I worked in Educational/Tech starting in 1981. Apple IIs and moved on to “sophisticated systems” which provided pacing and grading, etc. While ed/tech provides real services to many students, it does not provide the insights and caring which can only be provided by a skilled, caring, well-trained educator. Yes, automation and artificial intelligence are here to stay and will continue to expand geometrically. Students must learn to use these tools in order to live in our future. My experience tells me we must have superior educators, dedicated, humanist, well trained with at least a Masters Degree, professional, respected, well paid, a continuously updated skills program. and very importantly… time to think, develop lesson plans which meet the needs of individual students. Students are not machines… DeVos appears to think they are or will see that they become machines. I suspect DeVos and her family are thinking big money? Strange, they want unregulated business and well-regulated humans, … or maybe not so strange? I have a Collegue who “flipped” his calculus class. He puts his lectures on line and the students watch them and come into class with questions about how to work some of the problems. My brother had a teacher that flipped his civics class back in the sixties. The kids went home and read their lessons, then the teacher asked them questions in class about what they read and recorded correct answers. Revolutionary.